“The toilet is charming, you have to lift up a lock and it folds out. It’s utterly divine,” said Patricius, the cabin attendant, topping up my glass of Prosecco and swelling with pride. In almost 80 train journeys around the world I was yet to discover a toilet that could be described as “charming” or “divine”, but later that afternoon, as I perched on the lid of the loo for a selfie, I was certainly impressed by the brass fittings and fifteen layers of varnish on the mahogany walls. In truth, over the previous few weeks my faith in the romance of train travel had begun to shake: my companions snored, got drunk, and threw food on the floor, they took off smelly shoes, hogged luggage racks, and looked more like Russell Grant than Cary Grant. While this had its own comic charm, the notion of romance was now as creaky as the carriages I slept in – that is, until I boarded the Venice Simplon-Orient-Express and spent two days riding through a train traveller’s dream. Amid the row of grey, grubby trains at Venezia Santa Lucia station, stood a blue and gold beauty at platform four. Polished and prompting curious stares, the 1920s carriages embodied the elegance and thrill of travel in the movies. Handing over my evening dress and incongruous rucksack, I was escorted to my carpeted suite where I wound down the wooden window and stretched out on a cushioned banquette, breathing in the scent of fresh flowers on my table. As the train eased out of the station I lay back and watched the Venetian waters twinkle past in the sunshine. No strangers would be entering my cabin other than Paolo – in a black tailcoat with yellow trimming – to offer a choice of two lunch sittings. As we travelled from Italy to Austria, through Switzerland to France, I wouldn’t have to shuffle up, move my bags or stuff cotton in my ears. I was free to read, doze or listen to the silk-suited pianist play Moon River in the bar until we drew in to Calais and changed trains for the journey to London. That night, dolled-up in a 1950s rose-pink dress, wearing matching pearls, I cupped my hands to the window of the Etoile du Nord dining car and watched the almost-blue snow of the Austrian Alps sweep down into a valley where chalets glowed like a cluster of golden orbs. In the reflection from the table lamp I observed men in black tie clink glasses with ladies wearing elbow gloves and flapper headbands, and waiters deftly catching bottles and carafes as the train curved around the mountainside. A perfectly rehearsed performance played around me and I felt like the star of the show. This was the railfan’s fantasy brought to life: to dine on foie gras lasagne with sweet chicken oysters; to sleep in a butler-prepared bunk; to close eyes in Geneva and wake in Paris. The museum-like train, with its René Lalique décor was no more than a hologram, and a recreation of a time now gone. But we were all in on the ruse, and I had my fellow passengers to thank for playing their roles for one night only and keeping the romance of train travel alive. Licking the salty oil from my fingers, I considered buying another plate of hot, golden vadas (fritters) when a vendor pushed through the door calling “chicken lollipop, chicken lollipop”. Whipping out a roll of 10-rupee notes, I salivated as he produced four tiny chicken legs wrapped in foil. I was barely three hours into the 11-hour journey and I’d already wolfed down idlis and coconut chutney, deep-fried baby corn, crisp pakoras and at least four cups of treacle-sweet tea. The Mandovi Express from Mumbai CST to Madgaon in Goa is one of Indian Railways’ most beloved trains. Winding down the Konkan coast, it passes through 92 tunnels and crosses 2,000 bridges including the Panval Nadi viaduct, the highest in India. This is one of the only stretches of India’s 40,400 miles of track that the British dared not construct, leaving it to Indian engineers to bore through the Western Ghats, succumbing to flash floods and landslides in an attempt to extend the line through some of the most treacherous, but beautiful, scenery in India. Flanked by jungles of palm and silver sheets of water cascading down cliffs, passenger trains first ran in 1998 and it soon became a favourite among India’s rail enthusiasts – not least for its pantry car. Last year a terrifying rumour ran riot that Indian Railways was going to do away with pantry cars and begin selling fast food. It would have been a travesty for most travellers who look forward to the chaiwallahs, regional varieties of hot snacks, biryani, and ice cream. Fortunately it turned out to be false and it was a relief to stroll through the car and watch Ahuja Caterers’ chefs rolling dough for fresh chapatis, chopping chunks of fiery papaya and tossing cauliflower in karahis. Six years ago I had fallen in love with this train. Travelling at no more than a jogging pace, the train has doors that are always open, allowing passengers to lean out. It was here that I used to read books, enjoying the sunshine on my arms, away from the chill of the air-conditioned carriages. Now, as I perched on the top step, the warm wind tickling my cheeks, the smell of recently burnt fields sweeping through the carriage, I felt a surge of nostalgia and a sense of home. I watched as bullocks swished their tails by rivers, little white birds perched on their backs. Children played cricket with planks and tennis balls, pausing only to wave as the train rattled past, and the sun skimmed the tops of the palms. At that moment I realised there was a magic and charm in travelling on Indian trains that no other country could match. If travelling on more than one train in India, it makes sense to buy an IndRail pass from Shankar Dandapani, the UK Indian Railways agent (info@indiarail.co.uk). Enriched oxygen was supposed to smell and taste sweet. But the stream of air hissing out of the gold nozzle by my head had dank undertones of cigarettes that induced a wave of nausea. Reaching up to 5,200 metres above sea level, train compartments on the Qinghai railway are fitted with oxygen jets to alleviate the symptoms of altitude sickness, along with several warning signs that do little to deter stubborn Chinese passengers who hide in the loos and smoke. Pulling on my thermals, I readjusted the surgeon’s mask around my mouth and nose and sulked quietly, my asthmatic lungs withering in despair. After a month on Chinese trains I’d become accustomed to the spitting, hacking and crunch of empty sunflower seeds beneath my feet, but the constant flouting of no-smoking rules had turned me into Miss Marple, and had me and my nostrils twitching our way up the train, sniffing at compartment doors to admonish the culprits. Now resigned to the situation, I pulled down a seat in the corridor and leant against the window watching the soft, sugar-dusted brown mountains slope in the foreground. Tumbles of white cloud rolled around a sky so blue it made my eyes shrink from the glare, and rough-looking yaks nibbled at the yellow dryness of the plateau. Silver lakes like spills of liquid mercury were darkened by shadows of cloud and every hour or so the odd nomadic yurt appeared fringed with multi-coloured prayer flags. As the train climbed towards Lhasa we swept closer to the shimmering blue ice and snow of the Kunlun mountains and I soon forgot about the headaches and shortness of breath. I had seen nothing like this in my life and knew I never would again. Opened in 2006, the Qinghai railway from Xining to Lhasa is a feat of engineering excellence, holding the record for the world’s highest track and the highest station at Tanggula. Passing through an earthquake zone, the train travels on more than 300 miles of track built on permafrost that can melt at the slightest increase in temperature – a problem which engineers combatted by circulating liquid nitrogen below the rail bed in an attempt to keep it frozen year-round. But complications surrounding the railway are not just limited to practicalities. The birth of the railway was considered an ecological threat to the region and also a cultural one as it opened up another route for the already huge influx of ethnic Han Chinese flooding Lhasa and displacing the Tibetan people. Even today, it’s unusual to see Tibetans on board, almost all of whom are forbidden by the Chinese government from travelling in and out of Tibet. However, I had made my peace with my choice to travel to Tibet. I had travelled to North Korea a month earlier and had had no regrets, witnessing the country first-hand instead of reading reports and forming opinions, and I wanted to do the same in Tibet. As the train approached Lhasa, red Chinese flags poked up from every house and I took a deep breath before setting foot onto the roof of the world. Popping up like a gang of meerkats in fleeces, passengers craned necks towards the window with cameras in hand and false hope in their hearts. For the third time that day the alleged wildlife had scarpered so I slumped back in my seat. I’d long since given up on spotting bears and was content to gaze at the army of Douglas fir descending the mountainside – and maybe spy a skunk or two. For a brief moment I was filled with a sudden and sociopathic urge to slap the glass and scream “BEAR!” just for the fun of riling up my companions. Alas Gill and Tracy, a double-act in navy and neckerchiefs, began serving coffee and tea and I was forced to abandon the plan, sit back, and behave myself. Two days earlier in Vancouver I had boarded The Canadian, a train so beloved it’s even on the Canadian $10 note. Resembling a Dualit toaster from the 1950s, the silver juggernaut of a train rolled off at dusk, on a cross-country mission to Toronto, but pulled into Jasper after breakfast the next morning where I had hopped off to take a round-trip detour on the Skeena. The Skeena train from Jasper to Prince Rupert, also known fondly as “The Rupert Rocket”, or the rather dull official name “Train 5”, goes where no one else really goes. Way up north and wiggling west a little bit, the train cuts through British Columbia, terminating at the port town of Prince Rupert just 40 miles south of the Alaskan border where there is nothing to do but fish, hike and eat crab on Cow Bay Road. Canadians don’t take trains. They fly or drive their monster trucks from one province to the next, so taking the Skeena is the perfect way to go off-piste and travel with local residents and First Nations people, who, if not hitchhiking or waiting four days for a bus, have no other way to travel in this remote part of the country. It’s also home to some of Canada’s most beautiful scenery. Dusted with snow, the Rockies soared into an electric-blue sky, a perfect mirror image broadcast onto the still waters below. Tall trembling aspen lined the tracks, their round leaves shaking like tiny silver bells ringing in the slightest breeze. Staring mindlessly out of the window I began to tally up all the different trains of the previous four months when a large black bear standing in the middle of a field looked up as we flashed past. “BEAR!” I yelled, thrilled, and a bit smug that no one else had seen it. The sighting was a blessing as I saw little more than a herd of tatty-looking farmed bison once I’d got back on The Canadian – while munching through a bison burger. But where The Canadian faltered on wildlife it excelled in lamb steaks, pancakes, and beautiful lakes. Over four days and three nights we curled around mountains, cruised through prairies and arrived amid Toronto’s skyscrapers having undergone one of the greatest journey’s in the world. A mistake I made before travelling to Japan was to watch Lost in Translation and fall prey to Sofia Coppola’s soft-focus illusion. After two weeks of shooting around the country by Shinkansen – the fleet of high-speed, bottle-nosed beauties – it became clear that the film was little more than a stereotypical, insular portrait of a magnetic, complex and multi-layered nation. Almost everything in Japan is designed for efficiency: packets of chopsticks come with a toothpick; a sachet of mustard with ketchup squeezes out two separate lines on a hotdog; the backs of toilet doors have harnesses for mothers to set down their babies. And trains are designed to take passengers from one destination to another as fast and as safely as possible. Nothing more. The average delay is 36 seconds and a series of earthquake counter measures triggers automatic braking that can stop a train at 187mph within 300 metres – while our own trains are cancelled as a result of leaves on the track. 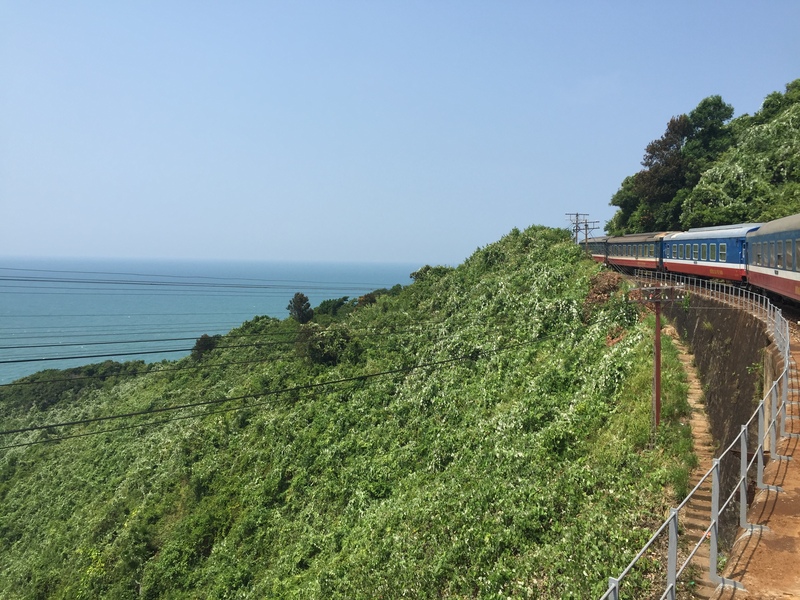 But where the spirit and soul of other Asian countries heaves out of train doorways – from clanging tea vats and steaming dumplings, to raucous card games and rocking babies – Japan’s trains are devoid. They slide up the platform with stealth, their bodies gleaming. On a blue square outside the doors, marked by a pair of painted white feet, a line of passengers makes a queue at a right angle. They slip in, take their seats, put in earphones, swipe their phones or shut their eyes. No one speaks. Sometimes they bring out ekiben – bento boxes containing regional specialities sold at stations. These beautiful wooden boxes are fitted with rice, breaded pork fillets or chicken teriyaki, black shreds of nori, or ginger, pickled pink. Ekiben look more like antique lacquered pieces for a mantelpiece, but they’re fast being replaced by the warm waft of KFC on board. During my first ride on the Sakura Shinkansen from Osaka to Hiroshima I stood a ten-pence piece on its side, and (just to check), stood on one leg in the aisle – neither of us fell over. Nothing but a low whistle of wind filled the cabin and when a fellow bullet train shot the other way we tilted for no more than a few seconds. All heads were bowed, some dozing, some reading, when the conductor entered the carriage, removed his hat and bowed deeply before working his way up the aisle checking tickets. After he reached the top of the carriage he turned around and bowed again before leaving. No one looked up and I felt bad. But it didn’t matter, nothing was lost in translation. In that small motion it became clear that Japanese trains didn’t need music and mess and colour to be alive and filled with soul. Joe hugged his bag to his chest and looked from the floor to the ceiling fan and then out of the window. At the age of 65 this was his first ever train journey: after retiring he had decided to treat himself to a week in Bangkok followed by an overnight journey home to Malaysia. Fishing a tiny Pentax from his breast pocket, he slid over to the window and put one hand to the glass, his eyes following each rusted rooftop and billboard as it sailed past. His tangible delight reaffirmed my own love for train travel. No matter how many trains I boarded, windows I peered through, or doorways I sat in, each new journey was like a present waiting to be unwrapped. Within an hour the dust and concrete of the city had given way to waterlogged paddy fields lined with palms so bent they grew in diagonals, criss-crossing at the waist. Passengers slipped into comfy pyjamas and spread woollen rugs across their knees. They peered into the baskets of vendors hawking chicken and steamed-up bags of sticky rice, and slurped on carrier bags full of rambutan – splitting open the hairy red cases to reveal white, lychee-like fruit. As the afternoon blurred into evening, un-read books lay face down on snoozing chests and outside the sun twinkled off the paddy, turning it to sheets of gold. At each station a gold-framed, mural-sized painting of the Thai king loomed through the window, flags and flowers adorning his figure. Shivering in the air-conditioning, I wandered into the vestibule and stood on the hinge of two carriages as they slid around, crashing against each other. Muggy air seeped in through the cracks and once I’d thawed out I swayed down the corridor following the deep aroma of fried fish and lemongrass to the dining car. Here was the hub of activity: French tourists in baggy T-shirts smoked through the open windows of the wood-panelled car; a Malaysian student sat sideways in a booth, his iPhone playing Selena Gomez; and waiters in waistcoats arranged red trays on white table cloths. For 170 baht (£3) four set menus offered a main of fried pork in oyster sauce or stir-fried seabass with celery, with a side dish of duck red curry or chicken green curry with jasmine rice and three firm pieces of pineapple for pudding. Stuffed, with my lips tingling from the dregs of chilli pork broth, I lingered until the sun had gone and the sky had darkened before winding my way back to my berth. Bedtime soon approached, and the guard arrived to push down the seats into one large berth, wide enough for two. This should have lent itself to a wonderful sleep had an attendant not called through the curtain at 6am to hand me a tray of steaming chicken congee sprinkled with diced spring onion and crisp shallots. But it was so delicious that all was forgiven and it was hard not to be drawn in and shaken awake by the scene outside the window of farms and lakes and villages setting up for the day. You can buy tickets for train 35, the International Express, from Bangkok to Butterworth, at Bangkok’s Hua Lamphong station. You can also reserve tickets from https://12go.asia/en which charges a £3.50 processing fee, and then collect them at the 12Go.asia counter at Bangkok station. A second-class air-conditioned sleeper costs around £25 one way. A groan came from the bunk above, followed by the sound of a pillow being punched, then furious muttering. I don’t speak Danish but I recognise foul language when I hear it. Mandolin music had begun to whine from a speaker outside our compartment accompanied by a woman’s voice so shrill that only dogs should have heard it. As it swelled and flooded the carriage it was now my turn to let loose a few expletives. At 6am this was not conducive to a relaxing journey. I had departed Hanoi at around 9pm the previous night on board what is commonly known as The Reunification Express – though no single train in Vietnam bears the name. Completed by French colonists in 1936, the line running from Hanoi to Saigon was severed in 1954 when Vietnam was divided into north and south. The railway then suffered from American bombing throughout the Vietnam War, but resumed its regular service in 1976. Now it’s a run-down, shabby service that has lost custom to budget airlines, but it is still the only way to witness the country in all its glory. During peak season an extra service numbered SE17, the Limited Express, is put on to cope with the demand and, to my delight, was limited in more ways than one. Paint peeled off the walls like dead skin and the air conditioner’s grill was secured by four pieces of sellotape – two of which were flapping off. The berths creaked, squeaked and clanked and the gold polyester curtain contained more dust than the inside of a Dyson. But the magic of this journey lay outside the carriages. For the first hour the train ran parallel to the highway with little more than a single wooden fence separating us from couples on scooters and trucks flitting past in the opposite direction. Racing neck and neck with lorry drivers chewing cigarettes and casting sideways glances into our compartment, the train then broke away from the road, swerving into the guts of the city and disappearing into the darkness of run-down houses lit by hurricane lamps and strung with children’s laundry. But the city soon fell away and the train thundered on through the night. By morning tiny tufts of cloud hovered around the sun as it rolled its way alongside the train. Thick waxy leaves flapped at the sides of the carriage parting to show stacks of green bananas like fists of fat fingers. Palm trees stood to attention and buffalo wallowed in lotus-filled water, tiny white birds perched on their backs. Children clattered from one end of the carriage to the other, peering into compartments then running away while parents in vests gazed out of the windows or played cards. Patriotic classical hits were cranked up high and a metal cart of deep-fried chicken legs, cabbage and rice was wheeled up and down around noon. vietnam-railway.com is a sales agency which will book your tickets and have them promptly delivered to your hotel in Vietnam.